Here we are, walking on crushed sea shells, boat upturned in the background and the salty smell of the sea in the air. Yup, we would be at Cape Porpoise in Kennebunkport Maine. Jenna and Mike wanted to go some place a bit different and away from their venue (The Tides Beach Club) for their wedding party photography. This was a fun options and I loved the overturned boats in the back and white sea shells on the ground. Those sea shells make a really nice reflector. 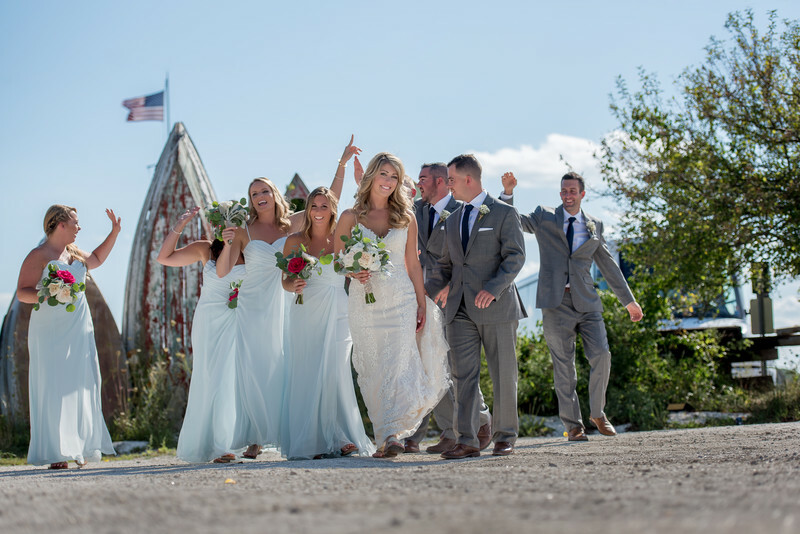 The cool blue dresses, sand and sea made the perfect "Maine" backdrop for their wedding. As a Maine wedding photographer I was in heaven. This images was taken from a low vantage point with a long telephoto lens. The low vantage point removed any background distractions and filled the sky with the lovely crisp blue complementing the bridesmaids dresses. Showing the group walking gives the images some energy. I waited for the moment where the bride and groom looked to each other and caught this frame. The pose is perfect, caught mid step and peeking into the camera softly. Location: Cape Porpoise, Kennebunkport, Maine.